Hopefully this is the right part of the forum to post. I’m looking to start building a garden railway in the near future and wanted to loosely base it on the Welshpool & Llanfair Light Railway using Accucraft wagons and coaches for stock. My issue however is around RTR motive power. I’m aware Accucraft produced an electric version of the W&LLR ‘countess’ however these seem to be rarer than hen’s teeth sadly and expensive (albeit i’m Sure worth every penny). As such does anyone have any suggestions for a RTR steam loco I could use and ‘Anglicise’ (or its Welsh equivalent) that might pass muster? I was thinking of a re-paint, adding nameplates etc. I have an lGB ‘2091’ Class I plan to do similar with. I’ll be using 45mm track if that helps and plan to use Remote Control as far as possible. I’m definitely of the school that ‘if it looks ok I’m happy/not fussed overly with scale or prototype accuracy. I too started out in that direction but have now diversified somewhat, for various reasons. Part of your problem is that Accucraft seem to have moved on from supplying W&LLR stuff. That has caused the prices of S/H stuff to stabilise at the higher end. There weren't all that many electric variants of the locos anyway, mostly Live Steam. 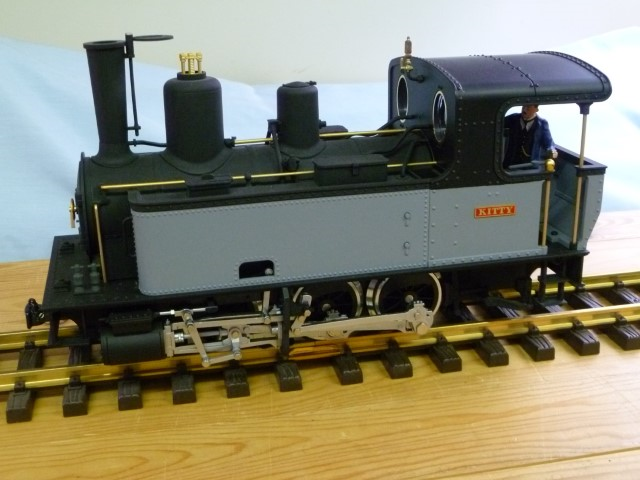 The Baguley Drewery (Chattenden) is still available and is fairly easily converted to battery power and R/C if you so desire. Other than that I think all that is left is a No 14 as Live Steam, and then whatever you can find S/H. I have the technology - have you got the 6 million dollars? You could think about an LGB U2, whilst they never had one the Austrian 0-8-0 that they have is on similar lines. One of the LGB U2’s should be a relatively easy conversion to Battery Ppwer if that is your thing. Plus a second hand good working example will not break the Bank. Yep, my mind was wandering that way - could be converted to an 0-8-0, come to think of it, didn't James Hilton do something like that? How about the LGB 20781 MTVS cl 030T Corpet - Louvet Steam Locomotive? I know it is French, but to my ill informed American eyes it looks fairly British to me. Also a couple of preowned older versions (LGB 2078) for $550. Would these be easier to rewire without the MTC ready interface? Does anyone make a Resita? You'd need to have two, then refurb the worst one and strip the best one apart, and flog off all the best bits. Just like they did with the one we gave them! How close is that, proportionally, to the Rugens 0-8-0? I was able to source an electric Countess just prior to becoming interested in live steam. I have in mind a job to convert at least one of my Corpets to Battery Power. Having been in side one it would not be a massive problem. After all if you look at some of my Battery Conversions, Corpet is a relatively larger loco. As for being W&L, well wrong Gauge, wrong Country etc but rule 1 can apply. I don't model any particular theme now (did that for 20 years in '0' gauge) and just wanted something a little less continental to run with some UK rolling stock. There were, after all, some unusual beasts operating on Britain's narrow gauge in its day. I run all sorts now, but I'm entirely live steam apart from one Diesel (battery), Chattenden. A good all round, any railway, steamer has to be a R/H Lady Anne or better Silver Lady, it just has the 'look', but Greg's looking for 'lectric. Here is a reference photo for size difference of the 1:19 Accucraft Countess and the LGB 1:22.5 Corpet Louvet, also borrowed from the link in my previous post. Perspective in that photo is not helping matters. The Countess does have a fairly big looking cab which roughly matches the height of coaches on the prototype so I suspect the same on the Accucraft models. Unless that is Bilbo Baggins on the throttle. Suggest a look at Irish engine bashed from Big Hauler - G Scale Central That's a cracking bash from a Bachmann Big-Hauler!